City Council is trying to determine if having City Hall open earlier and later than normal operating hours and closed on Fridays has been a benefit to employees and residents. 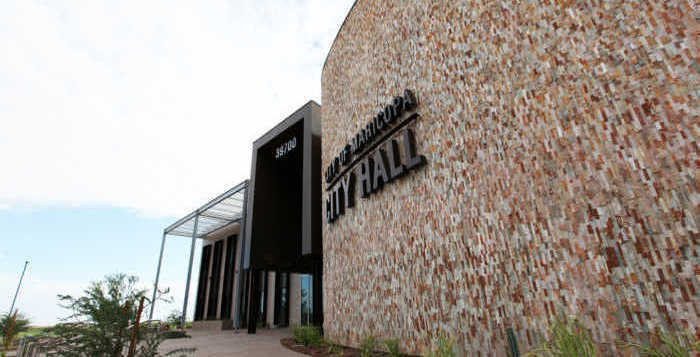 The Maricopa City Council weighed in on the city’s condensed hours of operation Tuesday, declaring an intragovernmental survey conducted on the matter was inadequate. The two-question survey did show that roughly 87 percent of non-elected city employees who participated preferred to work four 10-hour days – Monday-Thursday. However, the survey asked only two questions and had only 33 respondents. This lack of a sample size was deemed by several councilmembers as insufficient to close the books on the issue. Councilmember Nancy Smith, who said she first supported the two-question format, now feels the questions were inadequate and in need of constituent and customer input. Smith also noted the employee comments made in the survey, suggesting changing the four-day workweek could result in the loss of several employees. To combat any such flight, she suggested the survey consider an off-set or “hybrid” work schedule in which one group of people work Monday-Thursday and another group works Tuesday-Friday. She also suggested considering nine-hour workdays Monday-Thursday and four-hour Fridays. The city is historically slow on Fridays, from a business standpoint, given as the reason it moved to the four-10 workweek nearly five years ago. However, Smith said she wants to make sure the residents and businesses were getting reasonable access to their city government. Councilmember Peggy Chapados said she wanted to see other data concerning reductions in sick-time and improvements to employee morale. She indicated that morale should almost certainly be better considering the likelihood of Mondays being holidays, which essentially means a “mini vacation” for city employees. Even if the survey is expanded to residents, she said, she already knows what it will prove. To provide that, she suggested a gradual change such as possibly making City Hall open one Friday a month. City Manager Gregory Rose agreed with Smith and Chapados. However, he said, changing the work schedule doesn’t mean more employees, so it’s important to understand the impact of diluting services. Councilmember Vincent Manfredi, though reluctant to spend any money on a third-party survey, said he also felt the survey was not broad enough and should include the residents. “Regardless of what we want, it’s what the people want,” Manfredi said. Judge Lyle Riggs also weighed in, saying he wanted to consider a move in the opposite direction. The Maricopa Municipal Court is currently open on Fridays, which he said, much like the city, is its slowest day. Moving to a four-10 workweek for the court would not have much of an effect on the judicial process he said. In the case of search warrants or other emergency actions, he said he is still on-call 24-7. In light of the conversation, Council directed Rose to conduct more research, including a broader survey which will also lend consideration to the Municipal Court.